One of the first people killed in a hate crime after 9/11 was a family friend, Balbir Singh Sodhi. He was 52, a Sikh father who wore a turban and beard as part of his faith. He was the first of dozens of Sikhs and Muslims in America killed in the aftermath of the 2001 terrorist attack. But his murder barely made the evening news. I was 20 years old, afraid for both my country and community. 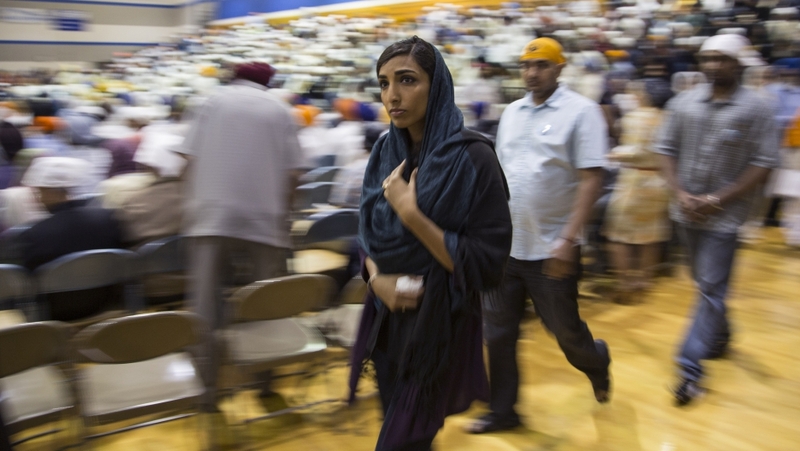 The Sikh faith calls us to social action, even in times of crisis. Desperate to act, I grabbed my camera and drove across the country to document stories of hate crimes. I was a student who had planned to become an academic. But like others in my generation, 9/11 turned me into an activist. My work with director Sharat Raju — now my husband — led to “Divided We Fall,” the first feature documentary on post-9/11 hate crimes. Back when we started, we thought the film would capture a chapter in US history, a brief explosion of hate toward Muslim and Sikh Americans. All our activism could not prevent the anger of this election year, the first one of my son’s life. When he was eight weeks old, we had to bundle him up and take him to his first vigil for three Muslim college students in Chapel Hill, shot in the head by a man who hated religion. Like many parents today, my husband and I realize we are raising a brown boy in a country that is more dangerous than the one we grew up in. Every night, when I put my son down to sleep in his crib, my heart aches. Tossing and turning in bed, I ask myself: What is the antidote? I think back to the places I have worked as a lawyer and filmmaker over the last 15 years: the still-shocked streets of NYC after 9/11; on street corners and in prayer halls where the blood was still fresh on the ground; in the basements of churches-turned-sanctuaries; and on the shores of Guantanamo Bay. Any time I have witnessed people overcome violence and injustice, a single force has been at work: The ethic of love. I believe that “revolutionary love“ is the call of our times. It’s the kind of love that drives courageous action to change our culture and politics. This love is not safe. It’s not easy. It requires loving people who don’t look like you, who disagree with you, or even hurt you. But I have seen communities who lead with love to create lasting change. I witnessed the ethic of love most vividly in the aftermath of a mass shooting in a Sikh gurdwara in Wisconsin four years ago. A white supremacist killed six people on a Sunday morning, but the community still gathered at the house of worship to pray for every person killed in the attacks, including the soul of the gunman. They decided to lead with the Sikh spirit of Chardi Kala: relentless optimism rooted in love. Together with the Sikh Coalition, which formed after 9/11 in response to hate crimes, they fought to change federal policy on how we record these crimes — and won. It’s odd to talk about love in an era of mass violence. But we’ve seen a resurgence in the language of love this election season. On the stage of the Democratic National Convention, Senator Cory Booker said we are called to be a nation of love. Reverend William Barber called Americans to shock their nation with the power of love. The last time love was central in US public discourse was the civil rights era, when faith leaders like Dr. Martin Luther King, Jr. called for love in the form of justice. What does it mean to make love a public ethic in American life today? For me, it means that I must choose love and optimism each day — even after fifteen years of fighting the same fight. So this Sunday, Sept. 11, I will stand in vigil at Ground Zero in New York with friends, including one whose step-father was a fireman killed in the attacks. Then on Thursday, Sept. 15, I will join the Sodhi family at the place where Balbir Sodhi was murdered in Mesa, Arizona. The site of his death has become a second ground zero, a place to honor the thousands of people who have been harmed or killed by hate since 9/11. First, we mourn. Then we organize. Because in the last fifteen years, at least one thing has changed: We don’t have to be victims or bystanders anymore. We can tell our own stories, author our own articles, make our own films, launch new campaigns, influence government and the media, and organize through technology and innovation. We have the tools to make love public in ways we haven’t seen before. This election season, each of us has the opportunity to lead with love — in schools and on streets, at roundtables and kitchen tables, online — and in the voting booth. The stakes have never been higher. In 25 years, by the time my son comes of age, America will be a majority-minority country. On the 15th anniversary of 9/11, we have a choice: Will we let the next generation inherit our fear and rage? Or will we recommit our nation to love? Today I choose love.